I’ve been on the lookout for a new moisturizer lately. Living in an area where we have 4 different seasons a year really takes a toll on your skin. Every year when it gets colder, my skin gets really dry from going in from the cold into a warm environment. The heater from my car and my space heater doesn’t help either. For the past couple of weeks, I’ve been using First Aid Beauty – Ultra Repair Cream but notice that it isn’t the best for your face. Especially not under makeup; it didn’t let my makeup spread evenly across my skin, and it almost wiped everything off as I was applying it. I went on instagram and asked my followers which moisturizer they recommend for winter. I got a lot of suggestions, but ultimately decided to go with IT Cosmetics – Confidence in a Cream. It was easily accessible to me to purchase at Sephora, and I was even able to get a sample of it before deciding to purchase the full size. Since Sephora has so many different moisturizers to choose from, I made sure to talk to one of the employees first and get other suggestions or to see if Confidence in a Cream is a good choice for my skin type. 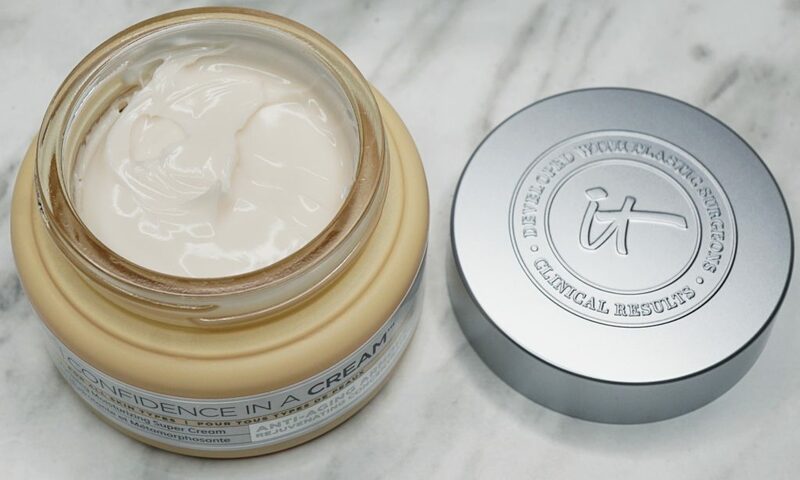 IT Cosmetics Confidence in a Cream is an ultra-hydrating moisturizer that rejuvenates, repairs, and restores skin for softer, smoother, younger-looking results. It’s said to be a remedy for fine lines and wrinkles, dryness, and loss of firmness and elasticity. I wanted a moisturizer that would be great to wear under makeup and this one does just that. It absorbs quickly into my skin and leaves it feeling hydrated. My makeup goes on effortlessly and looks great over top. Not only does this moisturizer hydrate my skin, but it has anti-aging properties in it. I’ve always had it ingrained in me to put a moisturizer on day/night so my skin stays hydrated and doesn’t age as quickly. As I approach my 30th birthday (omg), I am finding my skin reacts/doesn’t react to products the same as it used to. I notice it gets dry quicker and doesn’t have that natural glow. I am going to continue to use this moisturizer every morning (whether I wear makeup or not) since it has collagen and hyaluronic acid in it which is know to plump fine lines and wrinkles. It also has niacin, peptides, a super ceramide complex, and other active ingredients to help smooth texture, intensely hydrate, and enhance firmness. A lot of brands these days are moving away from having Parabens and Sulfates in them (most notable in hair products), but I am seeing a ton of skincare products without these as well. 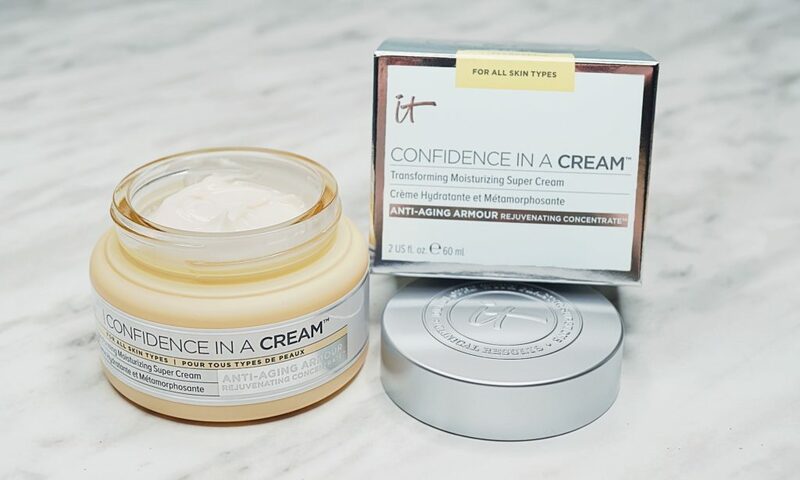 IT Cosmetics Confidence in a Cream is no different – they’re definitely following this. The only thing missing from this moisturizer is SPF, but from other moisturizers that I’ve used, it would just make this thicker and not quick drying. Overall, a great moisturizer and I’ve definitely seen a difference in my skin. It’s soft, hydrated, and keeps my makeup looking great all day long! 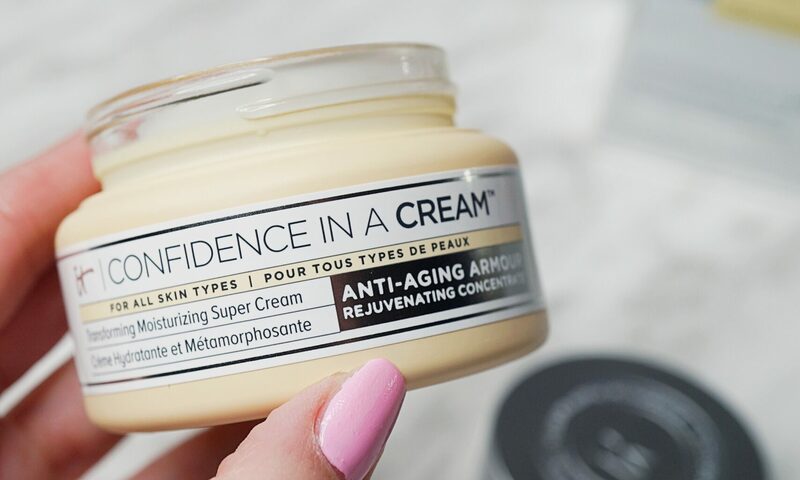 You can pick IT Cosmetics Confidence in a Cream ($62 CDN) online at It Cosmetics or online/in-store at Sephora. What are your thoughts on IT Cosmetics Confidence in a Cream?